Some time ago we listed the TOP 100 economics blogs, ordered according to their Onalytica Influence Index. Similarly to how academic journals compute their Impact Factor, we determined the most influential economics blogs based on the number of citations that they receive. A great deal has changed since half a year ago, when we published the 100 most influential blogs. Some of the blogs on the list no longer have regular posts. Others have grown and become better. Some blogs have only come under our radar in the recent months. 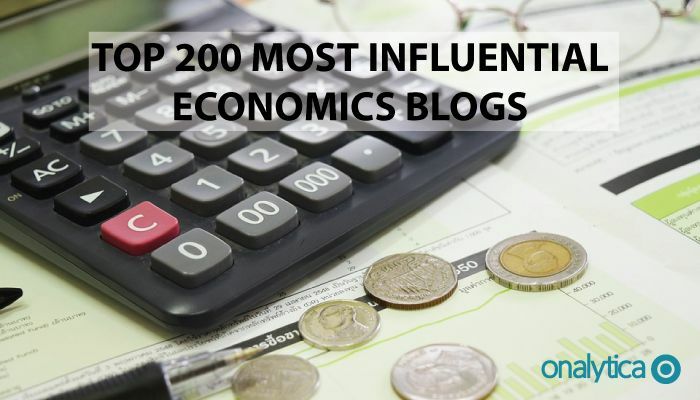 The Top 200 influential economics blogs ordered according to Onalytica Influence Index is listed below. As in the previous blog post related to influential economics blogs, the table contains the following metrics: Onalytica Influence Index (I), Popularity (P) and Over-Influence (O-I). We refer to the above mentioned post for an explanation of each metric. If we compare this ranking with the previous Top 100 influential blogs, we notice a few interesting aspects. To begin with, there isn’t much movement in the higher ranking blogs. Just as last time, The Conscience of a Liberal (Paul Krugman’s Blog), Economist’s View and Marginal Revolution are the top 3 influential economics blogs. Many blogs have a lower rank. This is caused by two factors: first, there are new entries, influential blogs that we have only recently started monitoring. The second cause of a lower rank for some blogs is the quantity and quality of citations they receive. There are a few blogs such as Institutional Economics that decreased both their levels of Influence and Popularity; this essentially means that the blog received fewer citations. Many of the blogs with a lower rank than in the previous Top 100 list have a comparable level of popularity but a much lower level of Influence. For example Andrew Gelman’s blog has a similar level of Popularity but only half of the Influence it had before. This is the effect of the quality of the citations it receives: lately it has been cited by less influential blogs. A small number of blogs have a higher rank than before. Sometimes, such as in the case of The Becker-Posner Blog, the number and quality of citations account for an increased rank. However, most of the blogs that are ranked higher than before have received citations from more influential blogs. This is the case with Angry Bear, a blog that has the same level of Popularity but has more than doubled its Influence in the last months. In our analysis, the data covers the period May 2011- November 2012. Have we missed anything? Have you noticed some interesting movements that we haven’t pointed out? Let us know!